We finally know, officially, how much it will cost to own the Chevy Volt. GM has announced that their electric car is up for pre-order for $41,000, with a tax credit of up to $7,500 lowering the tally. You can walk into a qualified GM dealership and order a Volt today in any of the seven launch markets—that's California, New York, Michigan, Connecticut, Texas, New Jersey and Washington DC—either to buy or to lease for $350/month for 36 months ($2,500 due at signing). Actual deliveries will come "late this year" in limited quantities. Every Volt will come with a 120-volt charge cord standard, while an additional 4,400 buyers will get a free charging station as part of a Department of Energy program. Full details below. It's important to note also that that $41k (or $33.5k with the tax credit) is the starting price, so bells and whistles could make the Chevy Volt a pretty pricey drive. Compared to the $101,500 Tesla Roadster S, though, it's a relative steal. SAN JOSE, CA – Starting today, participating Chevrolet dealers in launch markets will begin taking customer orders for the 2011 Chevrolet Volt, the industry's first electric vehicle with extended-range capability. Chevrolet is so confident in the overall value of the Volt that the brand will offer a lease program on the Volt with a monthly payment as low as $350 for 36 months at Manufacturer's Suggested Retail Price with $2,500 due at lease signing, including security deposit based on current conditions, which could vary at time of delivery. The benefit of the $7,500 tax credit is included in the reduced lease payment, with the tax credit going to the lessor. The Volt's MSRP will start at $41,000 ($33,500 net of the full federal tax credit, which ranges from $0-$7,500) including a destination freight charge of $720. Customer deliveries of the Chevrolet Volt are scheduled to begin in launch markets late this year with initial production limited. The Chevrolet Volt is the only electric vehicle that can operate under a range of weather climates and driving conditions with little concern of being stranded by a depleted battery. 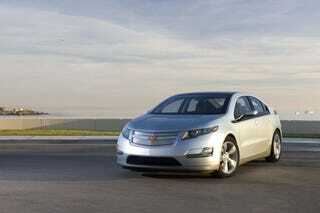 Volt has a total driving range of about 340 miles and is powered by electricity at all times. For up to the first 40 miles, the Volt drives gas- and tailpipe-emissions-free using electricity stored in its 16-kWh lithium-ion battery. When the Volt's battery runs low, a gas powered range-extending engine/generator seamlessly operates to extend the driving range another 300 miles on a full tank. Depending on their tax situation, Volt owners can qualify for up to $7,500 in U.S. Federal income tax credit, as well as other potential state and local tax credits, depending on location. Owners in certain states may qualify for the added convenience of High-Occupancy Vehicle (HOV) lane access. When it comes to advanced technology, Volt customers are on the leading edge. The 2011 Chevrolet Volt has standard technology features that link and entertain in innovative ways, starting with standard seven-inch touch screen navigation and an energy-efficient Bose premium audio system. The Volt is the first GM vehicle to offer five years of OnStar Directions and Connections service, which includes Automatic Crash Response, stolen vehicle assistance and connected navigation, all standard. Volt will expand on OnStar's foundation of leading-edge safety and security technology through the introduction of an OnStar-enabled mobile app that connects the vehicle to the owner's smartphone. "We wanted to make the Volt ownership experience unlike anything we've done at Chevrolet, because the Volt is unlike any vehicle we've offered," said Tony DiSalle, director of Chevrolet Volt product marketing. "We want customers to fully enjoy the Volt lifestyle by providing unprecedented connectivity to their vehicle through the Volt mobile app." The Volt also has an array of standard safety features, including eight air bags — dual-stage frontal, side-impact, knee, and roof-rail side-impact - and StabiliTrak electronic stability control with Traction Control. The Volt is constructed of 80 percent high-strength steel for additional safety and protection. Chevrolet will also provide customer assistance via a Volt advisor available 24/7 by phone or Internet. Dealers will also provide on-site dedicated Volt service and sales experts who will be able to address inquiries.